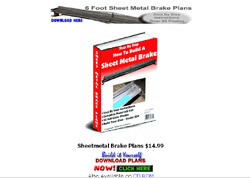 Sheet Metal Brake Plans - How to Build A Sheet Metal Brake is complete step by step instruction for building your own brake. Plans include detailed materials list, drawings and lots of photos to guide you through building a successful working sheet metal brake. Easily build your own sheet metal brake to make your own race car body parts.